The shadows themselves are fine and contain some noticable shimmer particles that - although they are rather heavy in the grey - aren't unappealing. I wasn't sure if I expected party metallics or vivid mattes but this quad has nothing near either and is actually quite mild. 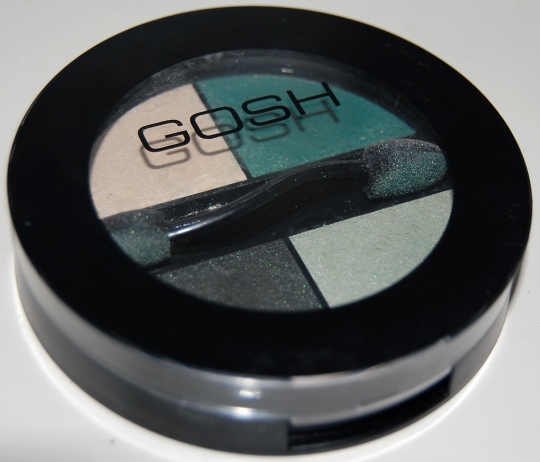 The shades within 'Evergreen' are a subtle white highlight shade, a pale green shade that makes for a good neutral base, a deeper rather pretty sea green and a green shimmer based grey that isn't really worth bothering with in my opinion. 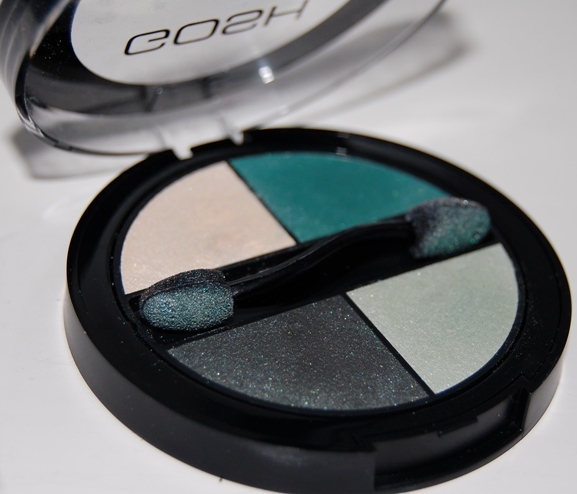 The greens give pleasant results and personally when I'm in need of a quick neutral eye I find that this quad can often suffice. I have worn them for 6+ hours and found minimal creasing so I can't argue with that. Despite the reasonable range in the colours, I think it's fair to take issue with the pigmentation. 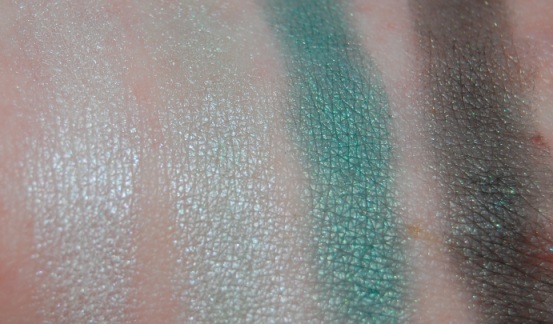 These photos were taken with a flash and these swatches were very heavy! The 2 paler shades are shimmery and quite sheer which I think is acceptable for a highlight but there is no single shade in the quad that gives the colour payoff when worn that I was expecting. There is versatility up to a point but I find that the dark grey isn't dark enough to give more than a grubby smudge when used with the provided applicator. I also find it considerably tones down the vividness of the greens! I prefer to use the other shades and sometimes use the white as a highlighter in other looks. Unfortunately none of these shades are pigmented enough to give any really dramatic contrast and I don't feel the finished look from this quad ends up anywhere near 'smokey' which is what I had originally hoped for. While I have reached for this to provide some neutral blended greens there is not much potential for drama. Instead there are some bases that while pleasant, weren't what I was expecting from the brand at all! If I was looking for some brights with strong pigmentation (which this summer I most definitely am) I'm not sure GOSH is the brand I'll reach for... and I'm a little bit disappointed!